It is indeed a privilege for me to be associated with the eighty fifth foundation day of the Indian Council of Agricultural Research (ICAR) and I am honoured to deliver the foundation day speech to address this gathering of eminent agricultural scientists and policy makers. At the outset, I would like to congratulate this august body for its distinguished service spanning more than eight decades to this nation. ICAR was set up with an important mandate to plan and promote education, research and its application in agriculture, agro-forestry, animal husbandry, home science, fisheries and allied sciences. It has today a comprehensive institutional infrastructure including four deemed universities, forty seven central institutes, seventeen national research centres and twenty five project directorates to carry out its objectives. I am told that ICAR has developed soil fertility maps for five hundred districts in 21 states; decision support systems for efficient nutrient management; watershed development models; resource conservation technologies in the Indo-Gangetic basin; 300 improved varieties of field crops; and 186 varieties of horticultural crops. The technologies and human resources developed by ICAR have made a stellar contribution in increasing agricultural productivity and production. When India gained Independence, our agriculture system was underdeveloped. Food grains production was not enough to feed every citizen. Before Independence, in 1943, our country faced one of the world's worst food disasters - the Bengal Famine - wherein an estimated four to five million people died of hunger. During 1946 to 1952, we imported on an average 3 million tonne of food grains annually. National food security became naturally a priority agenda for national development. Pandit Jawaharlal Nehru once remarked and I quote: "everything else can wait but not agriculture” (unquote). In the Sixties, the Government took multi-directional initiatives to strengthen agriculture. Research and development programmes were launched; new technologies, especially the seeds of high yielding rice and wheat varieties were procured and adopted. As a result, food grain production started increasing, and food imports ultimately ended. The era of ‘ship to mouth existence’ made way for the Green Revolution. India is today a leading producer of essential food commodities like wheat, rice, fresh fruits, vegetables, milk, eggs and fish. It has transformed from being a food-deficient to food surplus country and an exporter of agricultural produce. This, in the face of an ever increasing population, is a laudable achievement with few parallels. Our agriculture has become more resilient. Despite our country facing two severe droughts during the last decade, our agricultural production remained well above the 200 million tonne mark of grain production. Once again, I compliment the agricultural research and development system of our country for their untiring efforts. I am told that agriculture is now poised for a Rainbow Revolution fuelled by technology-induced growth in horticulture, livestock and fisheries sectors. Our agriculture sector has taken a great leap over the last few decades. Yet, there are challenges that lie ahead. Agriculture is the single biggest source of livelihood in our country. Some studies have indicated that a one percentage growth in agriculture is two to three times more effective in reducing poverty than a one percentage growth in non-farm sectors. The average growth rate in Agriculture and Allied sectors during the Eleventh Plan period was 3.6 per cent as against the average growth rate of the total economy of 8.0 per cent during this period. To alleviate poverty, promote inclusive growth on a sustainable basis, sustain food security, increase employment opportunities and boost rural incomes, our agriculture sector must be robust. We have envisaged the agriculture sector to grow at 4 per cent per annum during the Twelfth Plan period. The agricultural growth in the Eleventh Plan period was driven by improved agricultural prices. During the Twelfth Plan period, the growth in demand for major crops is projected to slow down. We have to achieve higher productivity levels to attain the agricultural growth target for this Plan period. We must place greater emphasis on productivity-driving measures such as diversification of crops, improvement in seed replacement rate, adoption of high yielding hybrid seeds, and improvement in water management practices. Though the Green Revolution in the Sixties and Seventies brought about a considerable rise in food production, the disproportionate use of chemical fertilizers eventually led to a decline in productivity. The need for balanced use of fertilizers and pesticides should be propagated amongst our farming community through agriculture education and extension programmes. ICAR and other agricultural institutions are engaged to promote fertilizer use efficiency. Latest technology must be deployed to assist decision-making by farmers regarding selection of crop variety, right agricultural practices and right markets to sell the produce. The Eastern region of our country, having abundant natural resources, has the potential to achieve much higher crop productivity. At the same time, rice production in agriculturally advanced areas of North-Western India has become unsustainable due to over exploitation of natural resources like land and water. We have devised a strategy for increasing production and productivity in the Eastern region to ensure food security, while reducing pressure on the North-Western region. As part of the Union Budget for 2010-11 a four-fold strategy was delineated covering agricultural production, reduction in wastage, credit support and thrust to the food processing sector. 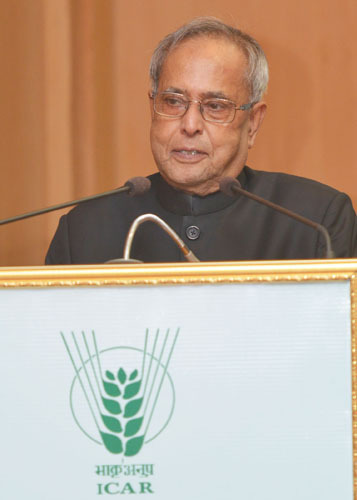 As part of the strategy, it was decided to implement ‘Bringing Green Revolution to Eastern India’ (BGREI) programme under Rashtriya Krishi Vikas Yojana in Assam, Bihar, Jharkhand, Eastern Uttar Pradesh, Chhattisgarh, Orissa and West Bengal to address issues of rice-based cropping system in these States. I am happy to note that as a result of these initiatives, farmers in the selected clusters have adopted new technology, good agricultural practices and benefitted from the yield advantage of hybrid rice technology. About 85 per cent farmers of India have small land holdings of less than 2 hectares, which restricts their full potential for production. To spur productivity growth in such farmlands, it is necessary to develop low-cost, light-weight, multi-purpose farm equipments. Mechanization of small farms is the need of the hour as it can also mitigate labour scarcity during peak season. Mechanization in agriculture should be facilitated by efficient energy management. To reduce dependence on conventional fuels and ensure sustainability, our research institutions must focus on renewable energy models like solar power and biofuels. Estimates have shown that seed quality accounts for 20-25 per cent of productivity. Timely availability of affordable quality seeds is crucial for achieving higher agricultural production. I am happy to note that ICAR and the State Agricultural Universities are engaged in production of breeder seed of all major crops to meet the requirements. Agro-processing deserves priority in our agricultural policy framework. Post-production losses of perishables and semi-perishables are high, estimated at 5.8-18.0 per cent and 6.8-12.5 per cent respectively. About 50 per cent of these losses are preventable, using suitable post-harvest technologies. Research should focus on cost-effective packaging technology to ensure easy transportation, product safety and prolonged shelf life. Climate change poses a major challenge to agricultural production. The National Mission for Sustainable Agriculture, launched under the National Action Plan on Climate Change, seeks to devise adaptation and mitigation strategies for ensuring food security. As the impact of climate change could transcend geo-political boundaries, we must actively engage with all national and international initiatives to chalk out a climate resilient development strategy. Development and introduction of genetically modified crops has the potential to revolutionize agriculture. The concerns over their perceived risks should be addressed by following internationally accepted procedures for assessing safety parameters. ICAR, which is involved in developing useful products and technologies in this field, must contribute to the public discourse and provide clarity on this sensitive issue. We must make agriculture an intellectually stimulating discipline and a rewarding profession to attract talent in this sector. Agricultural education should focus on the contemporary challenges of food insecurity; declining productivity; depletion of natural resources; increased risk from climate change; regional imbalance; rising input costs; changing food habits, and post-harvest management. It must provide an academic framework to these issues for greater understanding by our policy makers. The quality and relevance of agricultural research must be enhanced to bring within its domain cutting edge technologies like biosensors, genomics, biotechnology, nanotechnology and alternative energy sources. In our economy, agriculture retains its primary importance in terms of value creation and employment generation. There are millions of farmers tilling on small and marginal holdings. Our challenge is to reach out to the last farmland and equip them with the best cultivation methods. Improving the quality of agricultural education holds the key to driving not only agricultural growth but also developing technologies for sustainable agriculture leading to livelihood and nutritional security. I call upon the scientific fraternity to work towards a technology-led path for development of agriculture and prosperity for the farming community. ICAR has a brilliant history behind it. It has achieved results of great significance to this country and to the vast multitude of humanity. Your contributions; your relentless pursuit for excellence in agricultural education and research, gives us the courage to believe in ourselves; to aspire for an India free from hunger, poverty and deprivation. I am sure, as in the past, you will continue to live up to the great expectations of this great country. I wish you all success in your future endeavours.